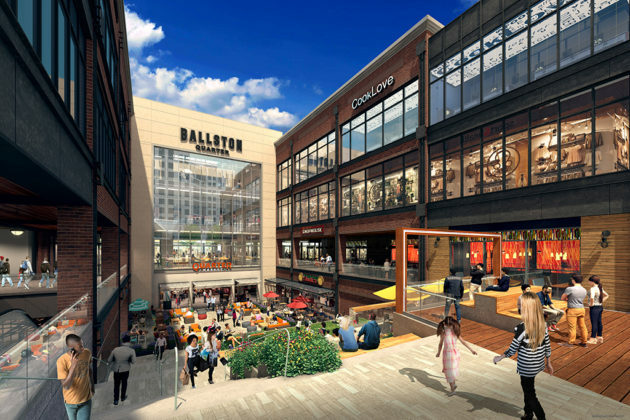 The renovated Ballston Quarter Mall will have a 25,000-square-foot food hall, developer Forest City announced today (Tuesday). 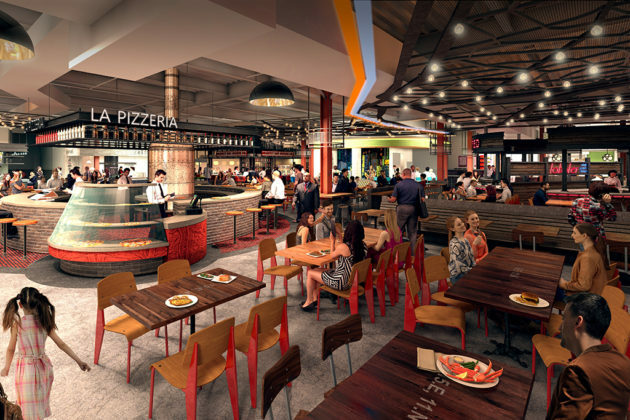 Called Quarter Market, the food hall will feature 18 restaurants, and officials hope it will serve as the anchor for the revamped mall. 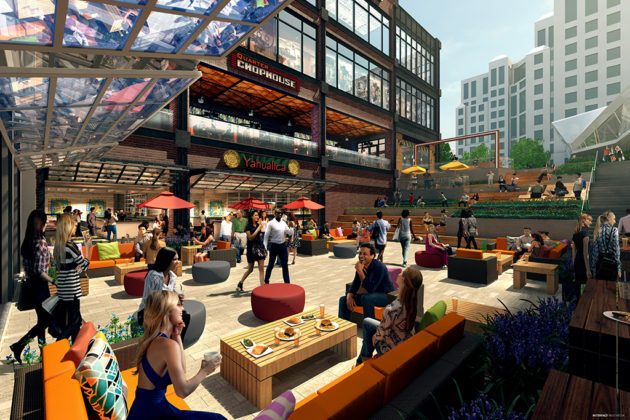 The food hall will be centered around a 5,000-square-foot public plaza, accessible via a walkway from Wilson Blvd. The plaza will include outdoor seating for two restaurants, as well as communal seating and space for other activities. The first nine restaurants to be announced as food hall tenants include hot dog food truck Swizzler, which will open its first brick-and-mortar location; and fast-casual noodle bar Mi & Yu. Other restaurants will include locally-owned Asian eatery Buredo, Ice Cream Jubilee’s first Virginia location and Pinch Dumplings, which already operates a stand at Nationals Park. 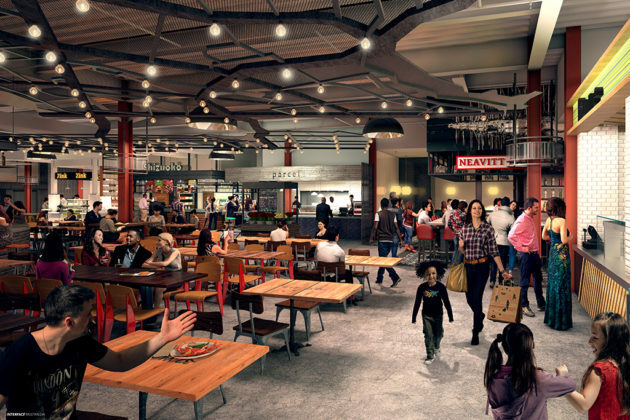 More food hall restaurants will be announced at a later date. 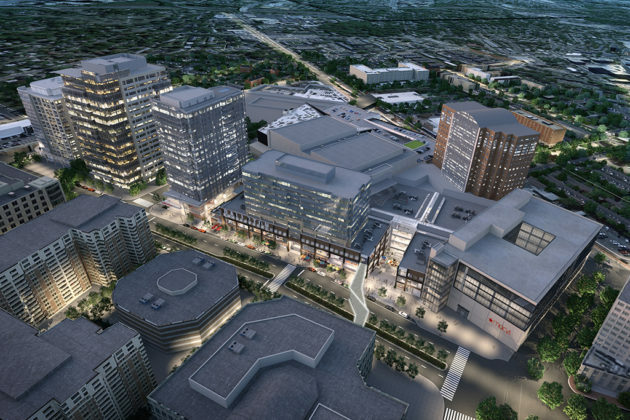 Construction on the entire mall project, which will include a high-rise apartment complex with more than 400 units, is scheduled to be completed in fall 2018. Full details from a press release on the first nine restaurants to be announced are after the jump. Bartaco: Bartaco is a modern Mexican restaurant, featuring fresh and flavorful menu items such as pork belly, duck or falafel tacos and unique cocktails. Sister restaurant to Barcelona Wine Bar, Bartaco describes their offerings as, “Upscale street food with a coastal vibe in a relaxed environment.” Bartaco will be located adjacent to the food hall with an order window connecting it to the common space. Buredo: Buredo is a local DC establishment, owned by two life-long childhood friends and D.C. natives who were looking for a unique, fresh lunch option. The handheld, burrito-size sushi rolls and salads feature Asian and other globally-inspired ingredients and flavors. Cucina Al Volo: Cucina Al Volo, which also has locations in Union Market and Adams Morgan, is growing its regional footprint for the first time into Virginia. The rustic casual Italian eatery will feature a wide variety of to-die-for homemade pastas, such as pappardelle with roasted lamb ragu and ossobuco risotto. Ice Cream Jubilee: Voted as one of the ‘Best Ice Cream Shops in America’ by Food & Wine Magazine, among many other accolades, Ice Cream Jubilee uses all-natural cream and milk from a local creamery, and they offer creative flavors such as coffee & doughnuts and banana bourbon caramel. This will be its first location in Virginia. Mi & Yu Noodle Bar: The Baltimore-based fast casual noodle bar, Mi & Yu Noodle Bar, which has two D.C. locations, features non-traditional ramen and steamed buns, which customers can customize to their liking. Their dishes stand out for their unique ingredients and spices. Pinch Dumplings: Pinch Dumplings serves traditional Chinese dumplings that are made from scratch daily, using high-quality, locally sourced ingredients. Originally started out of Baltimore, this will be the restaurant’s first brick and mortar location in the immediate D.C. area, complementing their stand at Nationals Park. Rice Crook: Rice Crook is the first brick and mortar restaurant concept from the founders of Bun’d Up, a Korean steamed bun food stand based out of the DMV. Rice Crook will offer delicious, home-made Korean rice bowls, featuring local, fresh produce and all-natural meats. Swizzler: Swizzler is one of the most adored D.C. food trucks, known for their corkscrew-shaped hot dogs and decadent, unique toppings. After participating in a restaurant incubator in D.C. this fall, this will be Swizzler’s first brick and mortar location. Timber Pizza Co.: With humble roots selling at farmers markets in the region, Timber Pizza Co. is now a D.C. staple famous for their Neapolitan-style wood-fired pies, with toppings such as chorizo and sweet potato fritters. They have won many accolades, such as ‘Best in D.C.’ from the Washington Post and, they were recently named as one of the ’50 Best New Restaurants in America’ by Bon Appétit.